Whether you’re loved-up, flirting, or just want to have a bit of fun to mark the most romantic day of the year, we’ve found plenty of treats for rooms to help set the mood – as well as a few top tips if Valentine’s Day inspires you to indulge a full-on passion for sensual decor. 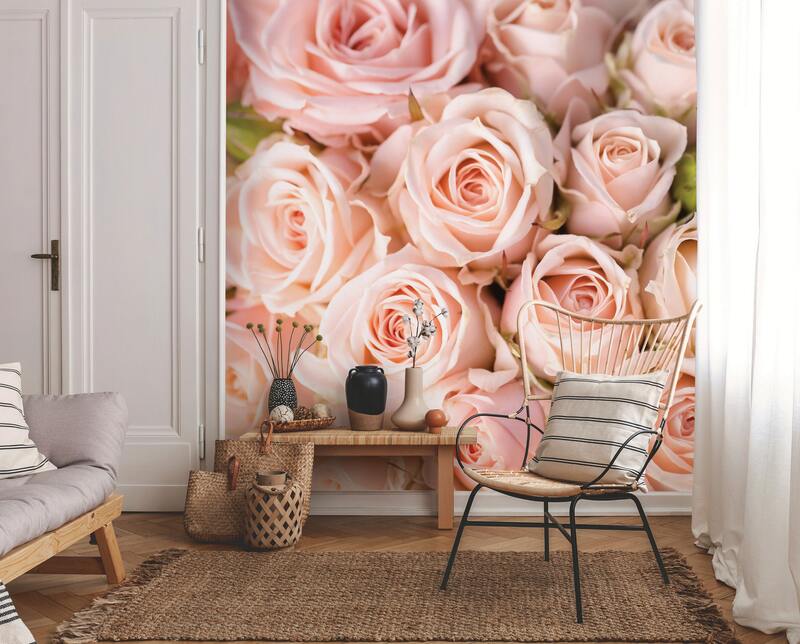 Create a stunning focal point with a Bright Pink Roses Wallpaper Mural, Wallsauce. If a bouquet of flowers – roses are the classic romantic gesture – seems too yesterday and predictable, and you really want to make an enduring gesture of affection, you could decorate a wall with a floral design mural that replicates a profusion of blooms instead. Today’s digital technology means floral designs look so real, they could have been freshly picked – and making a ‘blooming’ statement this way will also show you’re totally in tune with decor trends. 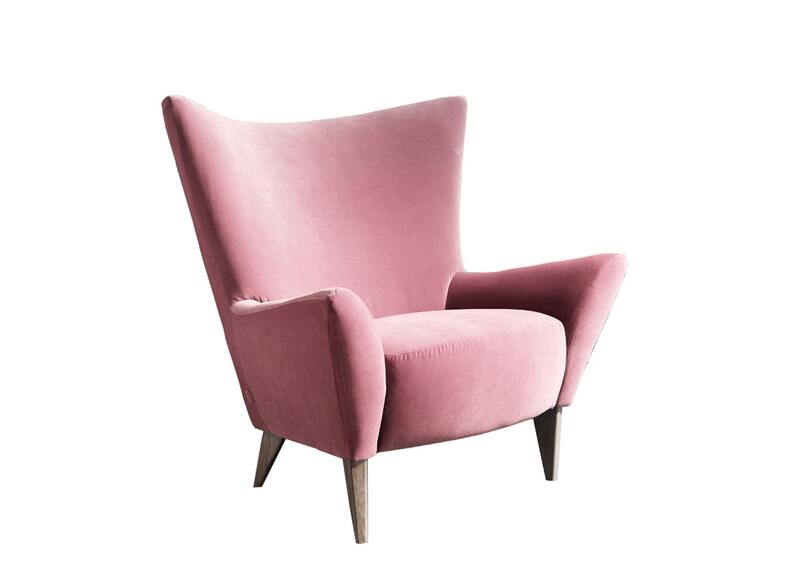 Matador Armchair (seen upholstered in Designers Guild Varese Velvet – Blossom, purchased separately) Content by Terence Conran. The Versailles Sacré Coeur Pink Velvet Bed, The French Bedroom Company. Pink Love Cushion, George Home; VQ Retro Mini Emma Bridgewater Digital Radio, Studio.co.uk; Michelle Keegan Sabina Fabric Accent Chair. There’s a fresh Scandi-feel to this room, with pure white walls and floor, and its pared-back decor allows the bedlinen to star. Rapport Home Scandi Hearts Red 100% Brushed Cotton Duvet Cover and Pillowcase Set. Jan Constantine Love and Heart Cushion, visit janconstantine.com for stockists; Lips Doormat, Red Candy; Double Love Heart Cushion (sheepskin), Baa Stool; Ellen DeGeneres By Royal Doulton Red Valentine Mug. 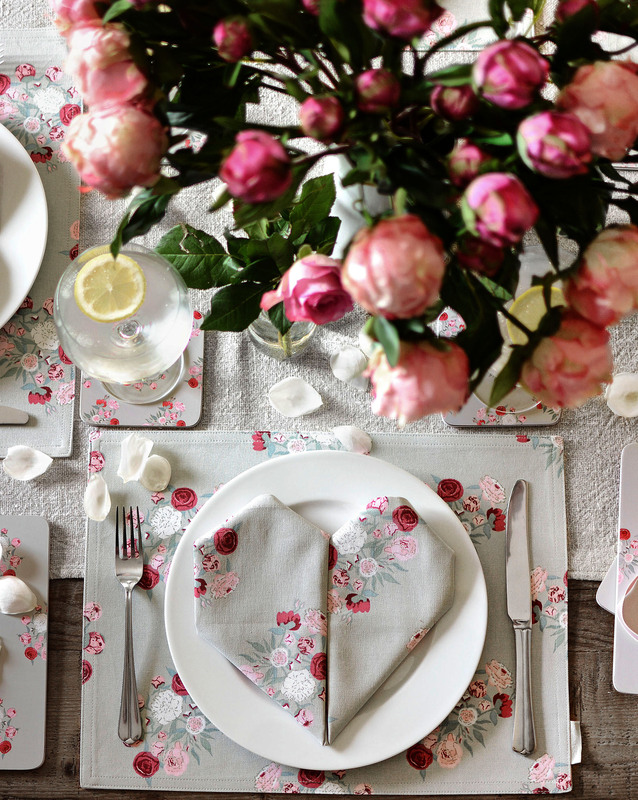 A scattering of rose petals and napkins folded into a heart shape add to this elegant table setting: Sophie Allport Peony Fabric Placemat, Peony Coasters – Set of Four. Love and food are inextricably linked, as both involve the same senses – taste, touch, smell and sight. A romantic meal should be a highlight of the Valentine evening, although an intimate breakfast could be a great way to start the day. Create your own sensual occasion with a pretty table setting. ‘Less is more’ is the rule here – so limit yourself to just a few nods to the hearts and roses theme, and it’ll be tasteful rather than tacky. A centrepiece bowl of flowers, hearts table scatter, soft candlelight and a romantic note on a plate, may be all the ingredients you need. Set of Heart Fans, Alessi Big Love Tea Spoons – Rose Gold – Set of Four, Hurn & Hurn; Pink Heart Shaped Plates – Be My Valentine – Set of Eight, Ginger Ray; Brushed Gold Champagne Flutes – Set of Two, Von Shef. 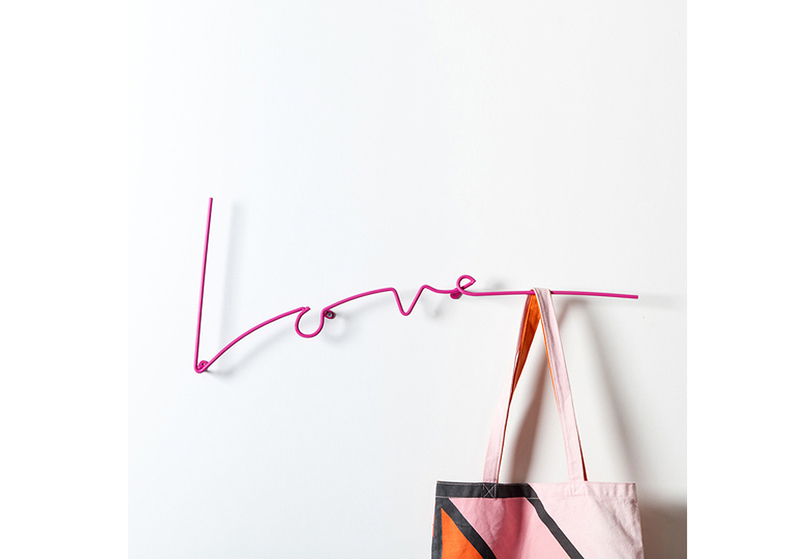 Block Love Coat Rack – Pink, £38, Red Candy. A word, a touch or a smile can be all that’s needed to show you really care, and are important year-round – not just on February 14. In other words, it’s the small things that count, just as much as big, showy gestures. 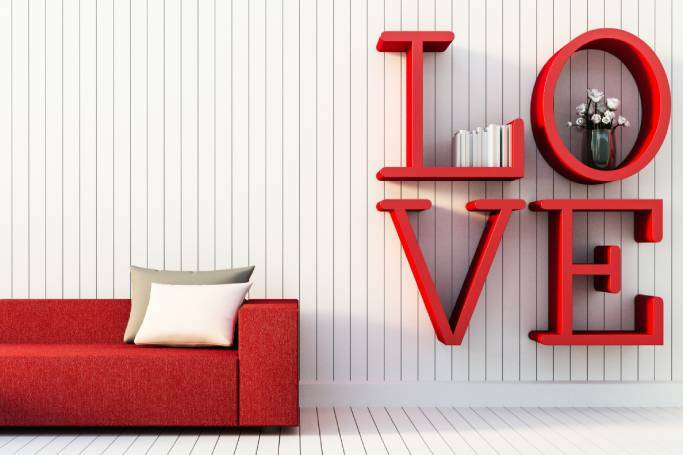 With that in mind, displaying a simple sign – either spelling the word ‘love’, in the shape of a heart, or love notes pegged up around the home with heart-shaped clips – could be a thoughtful way to celebrate the occasion. Love Heart Neon Light, Talking Tables; Gold Letter Love Wall Plaque, Melody Maison; White Wood Heart Peg Clips – Pack of Six, visit giselagraham.co.uk for stockists; Fairground Heart Light, Limelace.